The nail-biting tension of Jagged Edge combined with the riveting courtroom drama of A Few Good Men. 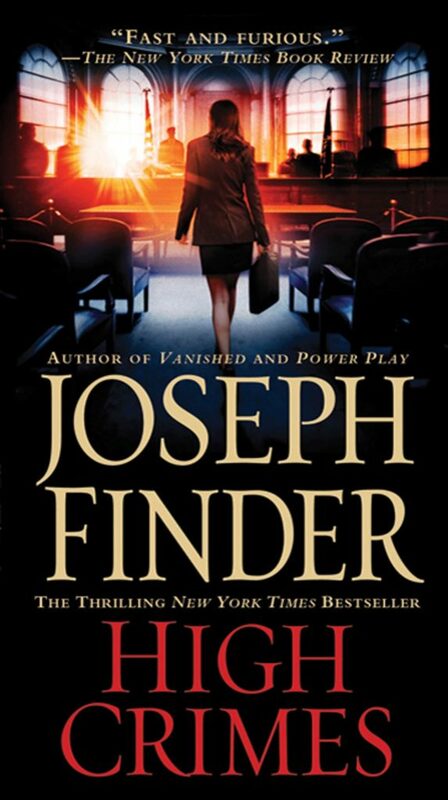 With each new Joseph Finder novel, a growing readership discovers a suspense writer Nelson DeMille has called a “master storyteller,” whose books People magazine has declared “pure dynamite,” and The New Yorker has hailed as “thrilling…the plot and pacing of a cineplex blockbuster.” Now Joseph Finder gives us his most powerful and gripping story yet, a bullet-fast, stay-up-all-night tale that taps into our most deep-seated fears. Claire Heller Chapman has the perfect life. She’s a Harvard law professor and a high-profile criminal defense attorney known for taking on—and winning—tough cases. But one day this perfect life is shattered when her husband Tom Chapman is suddenly arrested by a team of government agents and accused of a brutal crime he insists he didn’t commit. As Claire finds herself drawn closer into a web of duplicity and shadowy figures, she discovers that her husband is not who he says he is…that he once had a different name…even a different face. Now Claire must put her reputation on the line to defend Tom in a top-secret court-martial. As she searches for the truth, she begins to unravel an insidious, high-level government conspiracy that threatens not only her career but also her life, and the lives of her loved ones. All the while, she struggles to maintain her belief in her husband’s innocence—even when all the evidence seems to indicate that he is a cold-blooded murderer. With its vivid characters, razor-edge suspense, and an irresistible narrative force, HIGH CRIMES will seize you from the first page and hold you spellbound to the last. "Finder spins his tightest web yet . . . Rattling good entertainment." "Exciting . . . deliciously absorbing . . . full of hair-pin turns." At exactly nine o’clock in the morning, Claire Heller Chapman entered the cavernous old Harvard Law School lecture hall and found a small knot of reporters lying in wait for her. There were four or five of them, one a TV cameraman hefting a bulky videocam. She’d expected this. Ever since the Lambert verdict was announced, two days ago, she’d been fielding calls from journalists. Most of them she’d managed to avoid. Now they stood at the front of the old classroom, by her lectern, and as she walked right by them they shouted questions at her. Claire smiled blandly and could make out only fragments. “A brief comment, Professor,” said the TV reporter, a pretty blonde in a salmon suit with shoulder pads like a linebacker’s. Her criminal-law students sat in long arcs that radiated outward from the front of the room like the rings around Saturn. At Harvard Law School, the professor was construed as a deity. This morning the deity was being assaulted.